Above: RMP Class on the new range, which is about 80% complete. The MVT Training Facility has been running for just over a year now and there have been significant developments and additions to the facility itself, and also the training classes being offered. I started off with the Combat Rifle/Contact Drills (CRCD) class as the basic open enrollment tactical class. As we have developed classes to better serve your training progression, I have added more advanced classes such as Combat Patrol (CP), the progression classes such as the recent weapons manipulation class additions, as well as the building of a square range to host them. As we have reviewed the class offerings, and consulted students about it, it is apparent that CRCD has developed. At the same time, one of the main things that is holding back the learning experience of students on the tactical classes is their level of weapons manipulation training. Sometimes, Aaron and I have to call on the depths of our instructor-fu to coax some individuals through. Yes, we will get you through, and tailor the class to your ability and experience as you go up the lanes, but that is not really the point – we want to you to get the most out of the training. 1) Poor level of weapon manipulation skills. 2) Poor levels of PT. We can work with the PT. We can also work with the weapons manipulation skills – that is what we do. However, if you spend the weekend with your head in your weapon, unable to keep it in the fight, you are not getting the maximum learning experience. One of the things that students seem to hugely overestimate is their ability and skill at weapons manipulation. Remember, the tactical classes immerse you in a simulated combat environment and make you perform under stress. It is while operating under that stress that the poor manipulation skills come to the fore. Many people just don’t know how bad they are till they try and do this. It is an eye opener for many students. Here for Rifle Stoppage Drills. Start practicing! We have already added the Rifle Manipulation Primer (RMP) class as part of a pre-day to all CRCD classes. It runs along with combat lifesaver training. Due to people’s schedules, I have resisted making this compulsory. However, it is so useful to students that I am almost at that point – it will hugely increase your ability to learn on the CRCD class that follows – and either way, I strongly encourage you to attend the TC3/RMP training prior to CRCD classes. If I had my way, I would make it mandatory. We now have the Combat Rifle Manipulation Class available. As a result of AARs with students, one of the reasons we added both CRM and RMP was to provide a confidence building stepping stone to the tactical classes. Something you could also bring family members to if they were psyched out by the idea of CRCD. These manipulation classes will get your skills up to a level where you will be able to tackle the tactical classes with much more confidence. We are at the point where we have progressed so that CRCD is no longer ideally an entry level class. You can complete it, but you won’t get the maximum benefit from it if your manipulation skill level is low. 3) – you can demonstrate that you have taken at least 16 hours of accepted weapons manipulation training. MVT will have the final say on what training/schools we accept. Don’t try and bluff it, you are only cheating yourself. 4) Those currently booked onto CRCD classes as of the date of this post will be grandfathered in and will not require CRM. However, RMP is strongly encouraged (CRM encompasses RMP, and both classes are still encouraged prior to CRCD). 5) If, despite these prerequisites, you are able to bluff your way onto a class, and the remedial training/individual attention required to get you up to speed will affect the training experience of the rest of the class to an unacceptable level, MVT reserves the right to stand you down from the class. We haven’t done it yet, but with these new policies there isn’t really any excuse. One of the main problems we have is with students who have training scars from bad schools or self-training. RMP helps with this, but CRM helps a lot more. If I had my way, and knowing the quality of the training that Aaron runs, I would make CRM the the only acceptable prerequisite. That may happen down the road. For now, suitable equivalent training will be accepted. I am aware of the fact that many of you will travel a long way for MVT tactical classes because they are unique, but may not be willing/able to travel so far for what you may perceive to be ‘just another square range class.’ CRM isn’t that, in fact it incorporates many of the skills that dovetail right into CRCD (burst movement, bounding etc), but you won’t know that till you do! Just remember, we don’t expect you to be perfect when you show up to CRCD, that isn’t the point of training, but you should be workable. Attendance at CRM will also allow you to work out any equipment or gear craziness that you are unknowingly doing, and this will prep you a lot better for the tactical classes. (My apologies, apparently that was a quote from me from the weekend). Now that my curiosity has been roused would someone fess up? Here was my deal with CRCD and why I took it and probably skipped what I needed. I knew I could use a CRM type class even though I have fired thousands upon thousands of rounds thru all types of weapons, but I am of limited funds. At the same time I went East for CRCD good ol’ Mosby was conducting a combat rifle class a mere four hours away but I had to choose which class on how far a buck would go and CRCD won. Max cannot state it enough how much rifle manipulation means, in my CRCD there was much weaponry issues, even with the pros, and if you don’t know or have the confidence in the weapon you are not getting full value. I only wish CRM was offered in a traveling format. I think it would be a feeder to CRCD courses at MVT. And I “wish” that I had a printable flyer to post at the two largest gun clubs in N Illinois for fellow patriots to be exposed to as they shot the square range. Just paid my deposit for the August CRM and can’t wait to warm up my new S&W! Help me be a little fighter Aaron!! It’s time to start being real honest with ourselves. If you have never had formal training prior to CRCD then you are the target market for this kind of weapons manipulation training. Sometimes we don’t know what we don’t know. The worst offenders are YouTube entrepreneurs and the “dun bin shootin’ fer 20 years” group. It’s important to start formal professional training as soon as possible before your training scars hold you back. It’s easier to learn the right way first. See you on the range. You have to bring shortbread, shortbread. What, no quiche for you real men! Just make sure she doesn’t let Aaron eat it all while I’m over on the CRCD ranges…! Real men eat any damned thing they want! I am a shoot boss with the Appleseed Project. I have trained with my local PD as an auxiliary. I have no military experience. Should I take your CRM course. Absolutely. My understanding is the Appleseed is an excellent grounding in the fundamentals of marksmanship. The start of the training progression that I have described elsewhere, if you will. I’ve had a lot of apple seeders through my classes. With CRM we will transition you towards a dynamic combat environment, adding stress and movement. That will then prepare you very well as you move on to the tactical field training, such as found in CRCD and the Combat Patrol class. Without knowing anymore about you, you sound like someone who would get through CRCD, but who would benefit much more if you were to take CRM beforehand. I would send many/most CRCD graduates back through CRM for the training benefit that it would give them. Many do multiple CRCD classes for the greater understanding they get by repetition. CRM will help with that learning progression. Max, thanks for the feedback, what the heck, see you at a CRM. Need to cross reference your schedule with my Appleseed instruction schedule and will sign up as soon as I can. See you soon in West by God VA. Looking forward to it. Another Appleseed instructor here that has been to CRCD. I haven’t taken CRM but I learned why you should at CRCD. I made a tactical reload on a closed bolt while moving to cover. I didn’t fully seat the mag. I got off the first shot, told my buddy to move and then experienced failure to feed. After fiddling with it for several seconds, I finally changed mags. If that exercise would have been “for real”, my buddy might have been toast. A class like CRM teaches you to run your rifle efficiently under stress. PM me on the forum if you would like to know more about my CRCD experience. Brian, what is your Appleseed handle? Send me a PM on the MVT forum. I was an appleseed shoot boss and state coordinator for several years, running one of only a couple actual 400 yd KD ranges east of the Mississippi river. As well as being a national level ipsc and 3 gun competitor for 20 years. I can not agree more with Max’s statement that you NEED to attend his CRM in front of his CRCD course. There is no question that appleseed teaches what appleseed teaches, but there is also no question that fred’s course outline does NOT make you combat ready. It’ll teach you the basics 100% but as you’ll learn in WV, there’s a whole lot more to add to those basics. I see you already said you’re gonna do the CRM and I applaud you for making a great decision. You will be very happy that you did. Max- Similar situation to Corvette. I signed up for RMP/TC3/CRCD a couple of months ago. I’m ex-Navy, Appleseeder, NRA-instructor, shoot handgun matches (IDPA mostly) and some 3-Gun. Took Mas Ayoob’s first- and second-level defensive classes which included some defensive long-gun stuff. I’m driving up about from Florida not quite 1000 miles with a couple of other guys for your mid-October class. I had planned to do RMP anyway, before seeing your comments from today. Ideally I’d take the CRM, but I/we can’t come up other than for the 3-day weekend in October that we’d already planned. Per what you said, I’m grandfathered in to take RMP and CRCD. But, I do want to get the maximum benefit I can from this road trip up to train with you. Do you have any concerns with me/us completing CRCD? Is it possible perhaps to turn Friday before CRCD into something more like CRM and put off TC3 for a later time? Thoughts? These questions about acceptable equivalent training should be done by email. I’ll ask others with similar questions to email me. Thanks. You most likely qualify for a waiver (with no research, from my sofa) and are grandfathered in to CRCD anyway. However, I appreciate your concern to get the best results, which echo the reason we made this policy change. You will be doing RMP. In an ideal world you would do CRM. There may be scope for flexibility with some additonal private training on the Friday, while TC3 is going on, but we can talk by email. And I would need to coordinate with Aaron. If you aren’t a member of the MVT forum, I strongly recommend you sign up. There is tons of great information there. Also, I’m in Florida as well, send me a message thru the forum when you get a chance. I took the CRCD course last year. It was a long drive but worth it. Is CRM a two day course? I found no indication of this on the course description. Yes. 2 days. Dates on the class schedule page. It’s pleasing to see the positive responses. Max and I definitely discussed this change at length. I have no doubt this will make an already impressive learning experience even better for the students. I STRONGLY advise you take these classes in a progression starting with CRM. You will learn the habits that make you successful in all other courses you enroll in. Aaron and Max demonstrate and instruct in real world procedures that will make you a more efficient shooter. If you are worrying about the weapon you cannot focus on the tactical instruction. It is worth the extra dollars to start with a strong foundation. I have seen a lot of shooters who think the word “basic” or “foundation” does not apply to them. I would have taken the CRM class if it had been available before CRCD. I think this is a good idea. I am already signed up for a Sept. class which will include the RMP. I might work out better for those who have to travel a great distance, FL in my case, to have the CRM scheduled with either the CRCD or CP classes. It seems that they are now either running concurrently, or a week or 2 separate. I knew that was coming – it was similar thinking that led to the current 5 (6) day combined classes (CRCD and CP). Unfortunately, with current commitments between Aaron and myself (Aaron runs the CRM/RMP classes) we can’t organize what would have to be a 4 or 5 day of CRM-TC3/RMP-CRCD. You can do CRCD/CP in this manner, with TC3/RMP ahead of it. That is one of the reasons we are allowing other classes to qualify you for CRM. Travel. Ideally you would schedule them some time apart, doing CRM and coming back for CRCD, then perhaps combining the CRCD with a CP (5 day) or then coming back again and doing patrol, as travel/vacation/budget/wife allow. Actually I was thinking about when you start the schedule for next year. I just paid for the night vision class. I have a PVS 14 and dbal along with a helmit. It did not ask which date I want to attend. I may have missed the way to pick the date. I would like to come on Aug 1 if possible. I need directions and times. 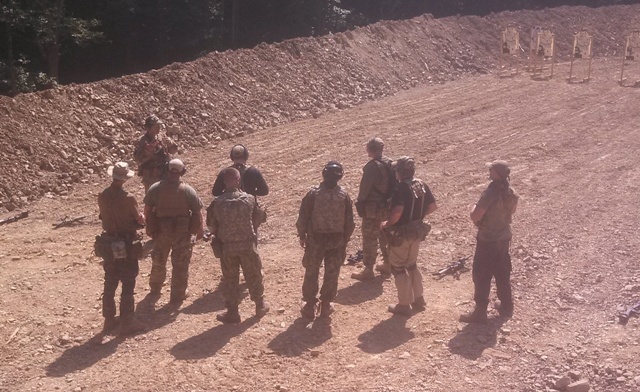 I took the Patroling class & TC3 from Mountain Guerilla in June last year.But I may take your class in the future. You put it in PayPal instructions to merchant, or email me. But I got it now. Hey Max, As I would agree on having a mandatory refresher course prior to CRCD, I would disagree on making (your) 2 day course mandatory. I traveled 5 hours (which was nothing compared to others)to your school to seek a specific specialty training. I had already taken several 2 day courses with Sig and John Farnam + others. My skill set level was competent but there were others in my class that had varying levels of skills more and less, but we were all there to learn and experience the drills first hand rather than reading them in a book. p.s. another suggestion would be to change out your targets 1/2 day. I noticed that once the targets became swiss cheese, my failure to drop the target increased and I started questioning my zero until I targeted a tree instead! You would have qualified for the exception by having done 16 hours of equivalency training. CRM will remain a prerequisite with that exception allowed. RMP will remain optional, but highly encouraged, on the Friday. It will serve as a refresher, a class for those who have been grandfathered in, and training for those who qualify through the 16 hour equivalency exception. As for the patrol class, you have no prerequisites because you qualify having done CRCD. Your buddies can’t do it unless they do CRCD anyway. If they want to do CRCD, the can qualify by doing CRM, or if they have classes like you did, they get a pass with the 16 hour equivalency. So what they deal with all ‘these prerequisites?’ Either they qualify or they don’t. If they don’t they need to do the training to bring them up to a workable standard. You commented yourself about the varying levels on your CRCD – something that this new policy is designed to fix. (not that I really believe these other classes are equivalent, but it is what it is for now).